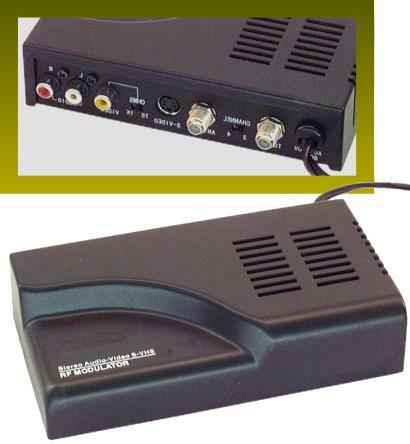 This allows you to use a DVD player, game system, camcorder, or any other composite video source on a TV that doesn't have the composite input jacks. It modulates your signal to either Channel 3 or Channel 4 (user selectable). Inputs can be either Composite video or SVHS, along with Left & Right Audio. When there is no signal present on the Video side, the coax from the Antenna or CATV is automatically connected through to the TV so regular channels can be viewed. When there is a signal present on the Video side, the Antenna or CATV is disconnected so the local Video can be viewed on Channel 3 or Channel 4. Has an AC cord to plug directly into wall outlet, no power adapter is needed (runs on 120VAC 60Hz 4.5 Watts). Actual item may vary in appearance from what is shown. All contents Copyright © 1996-2010. All Rights Reserved.